Spades is a 4 player card game that involves two teams trying to win tricks in order to gain points. In most games of Spades, you are playing to a certain point amount, usually 500. The team that first gets to the set point amount wins. Spades is a game of strategy and teamwork that can be a lot of fun. It is a lot like hearts, actually. This tutorial describes partner Spades, which is the most common. There are many other variants of this game. You will need a standard deck of 52 cards and a notepad to keep score. In Spades, there is some terminology that you will need to know before you start playing. During a hand of play, there are rounds called tricks. It is a quick round where each player lays down a card. Whoever has put down the highest card wins that round, which is often referred to as taking the trick. For each hand of Spades, there are 13 tricks that are played since each player is dealt 13 cards. Another important term you will need to know is trump. In the game of Spades, all the cards that have the suit, spades, are trump. This means that those cards are the highest value in the game. For example, the 2 of spades beats out the ace of hearts because it is trump. There are rules you need to follow when playing trump cards that will be covered below. When you start out, you can either choose who deals first or choose cards and whoever draws the highest becomes the first dealer. As the game goes on, the dealer changes after each hand moving clockwise. The dealer deals 13 cards to each player. In this variant of Spades, those players that are sitting across from one another are partners. The player to the dealer’s left starts the bidding. When you bid in Spades, you are guessing at how many tricks you think you can win. Your bid plus the number your partner bids is the amount of tricks needed to win in order to gain points. If you and your partner meet or exceed the bid number, you get points. Those points are the number of tricks you and your partner won multiplied by 10. If you and your partner don’t met your bid, then you lose points. The points you lose are the number of tricks the team had bid, multiplied by 10. If you underbid, any extra tricks you take are considered sandbags. For each of these sandbag tricks, you get an extra point. However, if you get 10 sandbags during a hand, you must subtract 100 points from your score. For this reason, it’s very important to bid as strategically as possible. During a hand in Spades, all players will lay down each of their 13 cards. This happens one at a time (each person in turn, clockwise, laying down a card to determine who wins that certain trick). Aces are high and spades are trump. The player to the dealer’s left starts out. 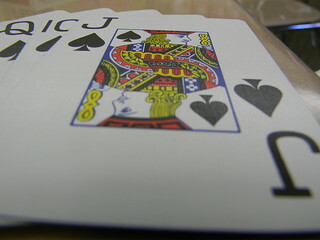 The rest of the players must match the suit of the first card unless they do not have a card of that suit in their hand. If he/she does not have a card of the suit that was first laid down, then they can trump the trick by laying down a spade. You win the trick if you lay down the highest card of the suit or lay down a spade (which can only be done if you don’t have any cards that are the same suit as the leading card of the trick). If there are spades in play, the highest spade played is the winner. A spade cannot be lead until a spade is used to trump a trick due to not having the suited card. You will need to keep track with your pen and paper the number of tricks you and your partner take. Usually it’s best if just one of the partners on each team keeps track as to not make things confusing. That person will need to write down the bids at the beginning of the hand, and then the number of tricks. That person will also have to keep note of each of the sandbag hands. If you are close to sandbagging, you can use strategy to lose the trick. Of course, this only works if your partner doesn’t win the trick as well. This is partly where the complex strategy of the game of Spades comes. Partners need to work together without discussing their cards. Talking strategy with your partner during hands is cheating. When the game begins, a number will need to be agreed upon with all the players as to the point value that needs to be reached to win the game. The standard number of points to win a game of Spades is 500, but this number can be changed to make the game shorter or longer to fit the needs of the people playing. It’s a good idea for the scorekeeper on each team to keep a running tally of how close their team is to reaching their goal. Some people play with a variation that makes the 2 of diamonds trump as well, valued between the ace and king of spades. You will need to discuss this or any other variations with all of the players before the game begins to make sure there is no confusion.